The weather was just perfect at Creve Coeur Heroes Day. Photos courtesy of Iva Johnson. Justin Ploog and Collin Dunn are providing Medical Standby Coverage today at the Microbrew 6K and 1 mile race in Moline, IL today. Photos courtesy of Justin Ploog. RiverMedic1 is putting in nighttime hours due to the increased number of boats on the water this weekend. Let’s all enjoy the weekend together safely! Photo courtesy of Carson Smith. Great work, Peoria Heights Police Department and Peoria Heights Fire Department friends! We attended several events this weekend, including the Northwoods Mall Community Health Day and the District 150 End of Year Bash. Photos courtesy of Clarissa Haywood. Don’t miss this great free event!! Visiting Valeska Hinton Early Ch Ed Ctr was another big highlight of our day. Photos courtesy of Iva Johnson and Clarissa Haywood. Don't forget to meet us in the park tomorrow for a great event and valuable giveaways! There is still another hour left to come over and learn life-saving skills! Homer reminds you that AMT is offering free hands-only CPR education at Dozer Park - Home of the Peoria Chiefs this evening. We have three stations in the concourse and the education is free of charge! It is great to see so many community leaders coming together to address the issue of opioid addiction harm reduction. It is an issue we are all concerned with every day. It’s a beautiful night for the Spring Fling concert event. Be safe and enjoy yourselves! We’ll be close by. Our very diverse work family at AMT includes a number of nurses who work hard everyday to provide outstanding emergency and non-emergency healthcare. Happy National Nurses' Week! Thank you to Harrison Primary for allowing us to come talk about the job we love. We’ll see you again soon! Caterpillar employees visited us today to get their CPR skills up. We always enjoy working with local employers to train their teams in life-saving skills. Photos courtesy of Yolanda Johnson. Our Creighton University/AMT Paramedic students made a visit to OSF Life Flight. Thank you for having us! Photo courtesy of Bret Ramp. Multiple agencies standing strong together to support Paramount, in honor of Steve Werner. Nice weather means our regular skills sharpening sessions can move outdoors! Photos courtesy of Tyler Ingold. Our Team’s thoughts are with those affected by this tragedy. Our own Kyle Gehling graduated from this fine program tonight, and the group working with AMT to promote the PulsePoint smartphone app was recognized with the best project award. Congratulations to all! We were thrilled to have the local Girl Scouts visit us at AMT Chillicothe. Photos courtesy of Carson Smith. We recognize bystanders whose heroic efforts save the lives of others. Last week, we met Justin and Mindy Lipes and heard their story of helping someone they’d never met. Thank you to them for stepping up! Mark your calendars! We'll be there. Our team's hearts go out to the victims of a fire near Chillicothe today. Photos courtesy of Julie Buckley. Thank you to the Chillicothe Park District for being prepared and trained and ready to save lives! Doors will be open soon for the Peoria Recovery Project. It’s going to be a big day! Please come visit us. Pekin Community High School Wellness Day is in full swing! Photos courtesy of Jessica Satterfield. This week we recognized Delavan Ambulance and the Delavan Fire Protection District for outstanding work saving a resident from sudden cardiac arrest. Our Peoria Area Chamber of Commerce Leadership Academy team did some great work to help us spread the word about our PulsePoint app. We appreciate all of their efforts! Thanks to Methodist College and Sterling Middle School for the chance today to talk about our careers to future healthcare providers. Our friends at the Pekin Police Department likely saved some lives locally! Off-duty paramedic Kamilla Soares was getting her nails done when she reacted to a PulsePoint #CPR-needed alert and saved a woman in cardiac arrest in the supermarket next door. With over 60 cases and counting in Central Illinois, we are asking for your help in spreading the word about this disturbing and deadly new trend in our communities. Our AMT Explorer Post 1718 group is learning all about EMS and will be at events with us throughout the summer. We are very excited to have them on our team. "From February til March, we saw the number of times we had encountered people taking these drugs quadruple," says Josh Bradshaw with AMT. "That was heavily skewed towards the end of the month. It really makes us concerned for what April is going to bring." Our Team sends their sincerest condolences to Nick’s family, friends, and many co-workers in both the fire and paramedic services. Our fleet technicians leverage the latest available technology to assure the highest level of safety for our team, our patients, and our communities. Nicole and Rachel visited Midwest Technical Institute to share their Emergency Medical Services experiences with medical assistants there. Photo courtesy of Nicole Allen. Come see us on March 29! Kota and Clarissa made some new friends and taught Hands-Only CPR at Northwoods Mall Community Days today. Thank you to all who stopped to say hello! To round out Heart Month, we were thrilled to return to Hy-Vee for their heart health event. Thanks to the Caravan group for having us! Brianna is one of our many stars who spend their off-shift time working with young people and giving them a better understanding of Emergency Medical Services. Spring is coming, and we are ready with fresh ambulances, some new team members, and lots of exciting training. Thank you to the Skills USA group from Manual Academy for spending a half day with us on Friday! 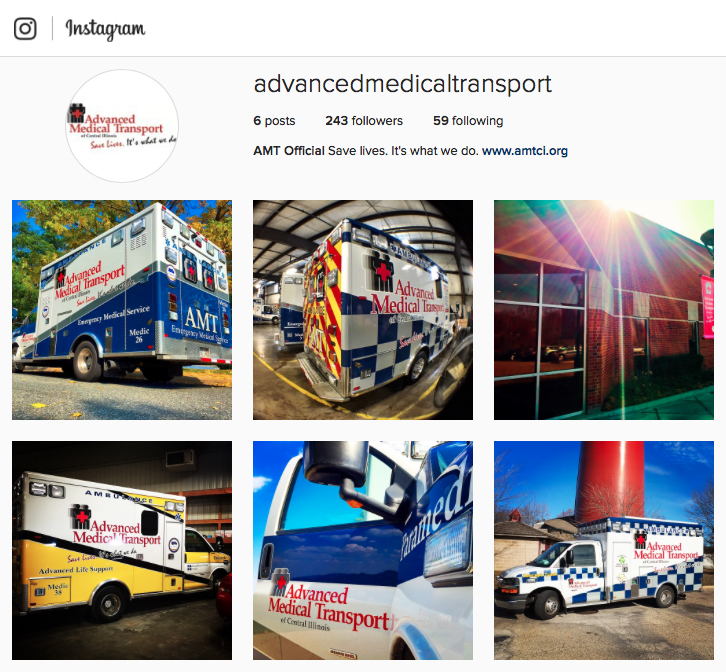 We have enjoyed having over 120 people visit AMT this week to learn about emergency medical services and pre-hospital healthcare. Two of our job shadowers came to us from Norway and Austria! Congratulations to our leader, Andrew, on this great honor! Please be aware of potentially dangerous road conditions, and stay in if you are able. Let’s not meet by accident! Our #TeamAMT stars from Princeville assembled for a picture to show their hometown pride. Photo courtesy of Jason Hill. We can all band together to help the underserved neighborhoods that are in danger of becoming food deserts. Please read below for information on how you may make a difference for those people. Methodist College are great friends of ours, and you'll often find us working together on community events. Our first large scale Hands-Only CPR education was a great success. Thank you to Hy-Vee for including us! Photo courtesy of Jessica Satterfield. Please lend the kind thought to the colleagues and family members of this man. About 60 Scouts in Washington’s Pack 206 learned how to save a life. Hands-Only CPR was a big hit with the Cub Scouts. Photos courtesy of Tyler Ingold. We salute Sandy and her dedication to Saving Lives! "They took marvelous care of me." Photo courtesy of Jeremy Sellers. The Peoria Area Chamber of Commerce is now well prepared to save a life with CPR and AED training. We love their new location, too! We are so proud to be a part of a caring community! We are all in this fight together. The opioid crisis continues to worsen, and AMT is working every day on ways to combat this issue in our community. We would like to thank JB Pritzker for visiting AMT today to talk about ways we can work to solve the opioid addiction crisis in our communities.